Background: This inconspicuous salamander is one of the most versatile and successful amphibian species in the Pacific Northwest (sharing that distinction with the Pacific Chorus Frog). It occurs from southeastern coastal Alaska to northern California, and as far inland as western Montana; and is found in habitats as varied as coastal rain forests, alpine meadows, dry grasslands, and sagebrush steppe. Populations of this species also thrive in some agricultural areas. Long-toed Salamanders can be found in suitable habitats throughout Washington State, except at high elevations. It is the earliest species to begin breeding each year (in some places as early as autumn, but typically in February in our area) and will utilize breeding habitats ranging from small temporary pools to permanent ponds, edges of lakes, and slow-moving streams. Although the species is common, its presence often goes unnoticed without special effort or chance encounters. The adults spend most of their time hidden under forest duff, in rotted logs, or underground in rodent burrows. Adult and Juvenile Description: Adults range in size to almost 3.5 inches from the tip of the snout to the vent, and 6.5 inches total length. Juveniles at metamorphosis may be as small as 1.25 inches snout-vent length. The body is a dark brown to black with an irregular and sometimes broken yellow to green stripe down the back. The species is named for the long toes on the hind feet, particularly the fourth hind toe. The costal grooves are distinct and the tail is dorsolaterally flattened (i.e., keeled). Although superficially similar in appearance to the Western Red-backed Salamander, the latter species has a relatively longer body with more costal grooves (usually 16), shorter legs, shorter toes, a rounded tail, and (on close inspection) nasolabial groves. Larval Description: Larvae of this species have a relatively large head with a broader snout than larvae of our other two pond-breeding salamanders (i.e., Northwestern Salamander and Rough-skinned Newt). There are prominent external gills on each side of the head, each of which is typically characterized by a long, pointed rachis or central stalk (large larvae may not share this feature), giving a spike-like appearance to the gills. The gill filaments vary in size along the rachis, tapering in length toward the tip. Like the larvae of our other pond-breeding salamanders, hatchlings have a club-like appendage on each side on the head, the “balancer.” True to the name, the balancers help the hatchling maintain an upright position, a role quickly assumed by the developing front legs. Balancers are typically shed within a few days after hatching. Larvae are usually tan or brown and generally lack the dark blotches, spots, or stripes characteristic of our other species, although slightly darker concentric bands may be present. Late in development rows of yellow spots may be present along the back or upper sides. Larvae of this species develop rapidly and generally metamorphose during their first summer (except at high elevation). Egg Mass Description: Eggs are laid in many relatively small masses (sometimes individually, particularly in the Cascades and further inland) that may be globular or elongated. 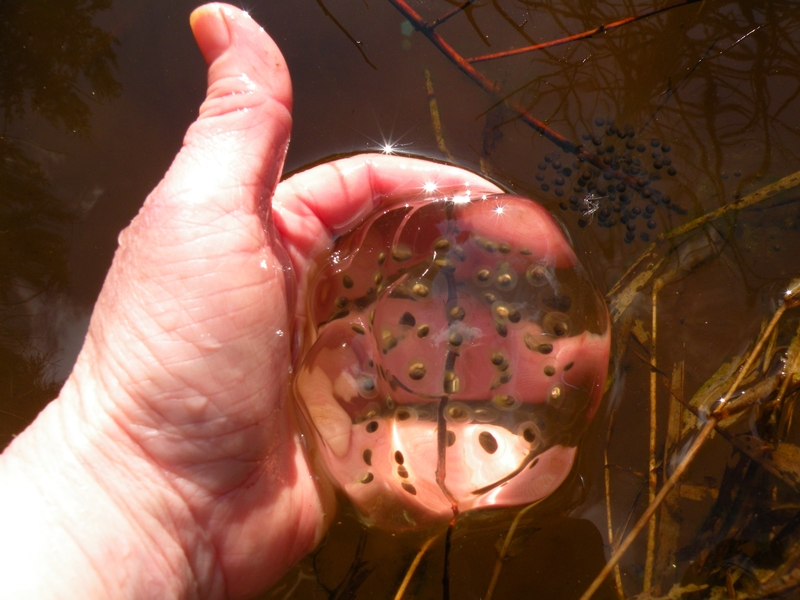 The eggs (minus the jelly capsules) are 2.0-2.5 mm diameter (larger than Pacific Chorus Frog eggs) and the surrounding capsules are thick (diameter of the egg and its capsules is about 10 mm) and clearly evident. The egg mass jelly is soft and masses are generally attached to(often surrounding) a stem or bottom substrate. Long-toed Salamander eggs may have already hatched when other species are just beginning to breed. Habitat: Long-toed Salamanders are terrestrial outside of the breeding season and can be found in diverse habitats including forests, fields, grasslands, and shrub-dominated areas, provided that suitable breeding habitats occur within dispersal distance. (Long-toed Salamanders have been tracked traveling distances of more than 1,000 meters, although most probably remain closer than this to breeding sites.) Suitable breeding habitats are also diverse, ranging from small, seasonal pools and ditches to the edges of large lakes, and newly formed pools may be readily colonized. Long-toed Salamanders occur, but do not thrive, at sites with predatory fish. Locations in Whatcom County: Known to occur at many locations in Whatcom County, particularly at lowland sites. Present in suburban areas where suitable breeding pools are available. The species is more easily overlooked by egg mass surveys than other species breeding on the spring, because of its early breeding and small egg masses. Sources: Corkran and Thoms. 1996. Amphibians of Oregon, Washington and British Columbia. Lone Pine Press, Renton, WA. pp 175.